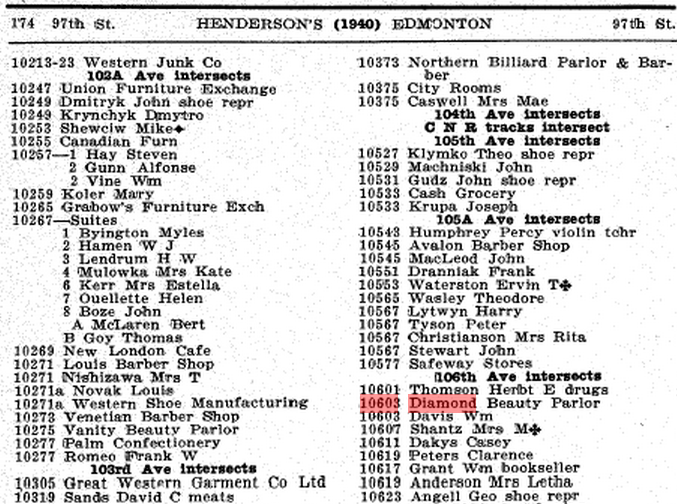 This entry was posted in Uncategorized and tagged 1940s, 97 Street 106 Ave, Diamond Beauty Parlor, edmonton, Hull Block, McCauley, Streetcars on June 13, 2014 by Yesterworld. This photo blend was made by #ForgottenEdmonton using Glenbow image NC-6-2382 and Google Streetview imagery. The Hull Block was built by William Roper Hull who was born in England and came to Canada with his brother John in 1873. They became involved in a number of businesses, including the cattle industry and the construction of several buildings in Calgary. Wm. Hull built the Hull Block in 1914 at a cost of $35,000. Plans for this building were prepared by architect Edward Collis Hopkins and called for a bath brick and white cast cement exterior. The contractor was Dunlop Johnson Construction Company. Hopkins’ design tends toward Edwardian Classicism or classic revival, a popular style for commercial blocks of the time. Elements of the style include a projecting pressed metal cornice, a decorated parapet with keystone and inscription (Hull Block), storefront cornice with dentils and ornamental keystones above the windows. Edward Hopkins was Alberta’s first Provincial Architect, appointed in 1905. He was later involved in the design of some of Edmonton’s most prominent landmarks including the Prince of Wales Armouries (1915), now home to the City of Edmonton Archives. The building has remained much the same over the years, except for the main floor businesses and their signage. For more than 40 years, the main floor was home to pharmacies. The resurgence of Chinatown in the 1990s brought new life. The Hull Block has been designated by the City of Edmonton as a Municipal Historic Resource. This entry was posted in Uncategorized and tagged 97 Street, edmonton, Hull Block, Image Blends, Streetcars on May 8, 2014 by Yesterworld.